Vivek's has always been a trendsetter and now, a wide choice of products, consumer electronics, household appliances await you in their shops across all of Southern India. Vivek's has the perfect electronics gifts for every occasion. Vivek’s e-Gift Card is a perfect gift for that start up home-maker, a friend's wedding, anniversary or birthday. 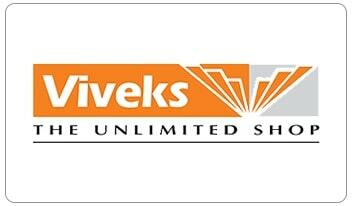 This E-Gift Card is currently redeemable for merchandise at all Viveks Stores across participating outlets. This E-Gift Card is redeemable for merchandise at all Viveks Stores across India (Excluding recharge of DTH & Mobile top-ups & for mobile phones). This e-gift card is not redeemable against purchase of mobile phones. This e-gift card is solely for the use of purchasing merchandise at participating Viveks exclusive stores only. This E-Gift Card is not redeemable for cash or credit.